Sen. Lincoln Chafee (RI), perhaps the most liberal Republican in the Senate, might be looking at defeat in November if Tuesday's primary results are any indication. While Chafee handily beat his Republican challenger, Cranston Mayor Stephen Laffey, it's the overall voter turnout that's key here. -Democratic Challenger Sheldon Whitehouse received more than 81% of the Democrat vote. -The total Democratic vote exceeded the total Republican vote by 21,439. 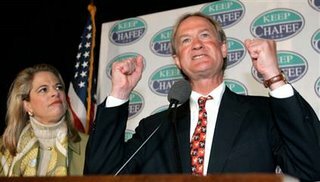 The data is a potential foreshadowing of the trouble Chafee faces this Fall if the Democratic Party wins the get-out-the-vote war. The very liberal Rhode Island is a critical battleground state in the Democrats' push to recapture the Senate. They need six seats to regain control, with Montana, Ohio, Missouri, Pennsylvania, Tennessee comprising the other key states. Virginia has recently beocme in play following Sen. George Allen's "macaca" blunder weeks ago. Allen's once commanding lead over Democratic challenger Jim Webb has diminished considerably. The radio station NOBODY listens to. Air America is alive and well. It is not going off. You are wrong about nobody listening to it. Where I live the station is owned by the very Republican Clear Channel and they have no plans to take it off. I just got their newsletter this morning with their new lineup. So to the poster above: Who are you and why are you so negative? Just remember if the Repubs keep control: It will be the Repubs who will be credited with destroying this once great country. looks like Cathy is now posting anonymously. From the Great State of Michigan, where idiots are lining up for unemployment - because of Bush. Cathy is one smart woman. The last major overhaul of the U.S. tax system occurred in 1986. At that time many of the deductions that Americans had used to lower their annual tax burdens were removed and taxpayers were handed what was essentially a two-tiered flat tax system. This so-called "tax reform" was sold to the American people as a tax simplification plan, but the reality was far different. Since 1986 this alleged "simpler" tax code has been modified no less than 9000 times, often at the behest of K-Street lobbyists, more than half of who earn incomes far above those of average Americans by inducing members of Congress to tinker with the tax code for the benefit of their clients. We understand that the members of this committee are interested in exploring ways to make our tax code simpler and more transparent. Americans can only hope that the ultimate goal would make the tax code so easily understood that virtually every American taxpayer would have a clear picture of just how much of their hard-earned income is being transferred to the federal government in the form of taxes. Today's tax code is anything but transparent to the average American, and one is left to wonder if this is not by design. On the notorious day known as "Tax Day," April 15th, an inquiry of a friend or co-worker as to how much they paid in taxes for the preceding year will, more often than not, be met with the response "I didn't have to pay anything! I'm getting some back!" With all due respect, I can't help but believe that the very thought of this response brings a broad smile to the face of many elected officials who view our tax system as a convenient way to not only fund the essential functions of our federal government, but also to acquire the funds necessary to purchase votes. Though I'm sure this doesn't apply to any of the members of this committee. The current system of tax withholding merely serves to further obfuscate the impact of federal taxes on the average American worker. This is easily illustrated by asking a coworker or friend the simple question "How much do you make?" The most common response will be "None of your business." Those who do not chose to ignore your question will, more often than not, begin their answer with the phrase "I take home ..." and then plug in the appropriate figure. Now if you're a rude and obnoxious radio talk show host you may well respond with "I didn't ask you how much you took home. I asked you how much you made!" The message, though, is clear. Due to the intricacies of our current tax code and the withholding system most income earners have no clear idea as to what they make or how much they pay in taxes. Again, a politician's dream. Present company excepted, of course. If a path to true tax transparency is one of the goals of this committee and these hearings, then the solution already exists in the form of The FairTax Act (H.R. 25, S 25) This legislation, first proposed by Georgia Republican Congressman John Linder, eliminates most of the taxes that so confound and confuse both individuals and businesses today. Under the FairTax, personal and corporate income taxes would be eliminated, as would capital gains taxes, estate taxes, Social Security taxes, Medicare taxes and taxes on dividends. In the place of all of these taxes we would institute an imbedded national sales tax in the amount of 23%. Let's be clear that this does not mean that the cost of all of these goods and services would increase by the amount of the new sales tax. Extensive research shows that the amount of embedded taxes in these goods and services under our present code averages 22%. The national sales tax merely replaces the imbedded taxes. If its tax transparency we want, consider this: Under the FairTax, when a consumer steps up to the cashier to purchase a $100 toaster, the sales receipt he or she receives would clearly indicate that $77 of the cost of that toaster is going to the retailer, with the remaining $23 going to the federal government in the form of taxes. What could be clearer? What could be more transparent? No longer would American workers lack a clear understanding of how much they're paying in federal taxes. Every time they are handed a sales receipt it would be spelled out for them. Likewise, no longer would the American worker have any doubt as to how much they were making. With no federal deductions from their paycheck the magic "take home" figure would, depending on deductions for state taxes, be the correct answer to the "how much do you make" question; that and the more appropriate "none of your business" response. With the FairTax April 15th becomes just another day. A day where Americans can celebrate the arrival of Spring rather than dread the arrival of their deadline for filing income taxes. The FairTax would address one of the other gaping problems with tax transparency in our current system. Though the average American spends around 57 hours a year doing the work necessary to complete and file a tax return, they consider this so much a part of their annual routine that they fail to calculate the cost of this lost time – time that amounts to nearly one and one-half work weeks. There have been many studies to determine the cost of tax compliance in America, and most estimates run at between $300 and $500 billion a year. I understand that this committee seeks ways to open the public's eyes to proposed and actual changes in our tax code that are designed for the specific benefit of one or two private businesses. My listeners are often perplexed when I inform them that there is one tax law on the books crafted to benefit a specific manufacturer of ceiling fans. With the FairTax, these manipulations cease. Many ideas have been floated that were designed to paint a clearer picture of our tax laws to the average citizen, but no idea has been proposed that would simplify our tax picture more so than the FairTax. Under the FairTax there is no necessity of developing a method to expose to public scrutiny tax changes favoring certain businesses or industries, because there would be no need for such changes in our code. Under the FairTax all American businesses, indeed all Americans would conduct their daily economic affairs with no tax component whatsoever on capital and labor. With the FairTax the federal tax picture would be crystal clear to all, businesses and wage earners alike. Business leaders would be able to concentrate their decision making on what is best for their business, their employees and their shareholders. Individuals would be able to save and invest with no tax consequences. You spend, you are taxed. You save, you are not. Just a few points in closing. The thought of a 23% retail sales tax on all consumer goods and services would sound horrifying to those in our lower income quintiles. First, we must remember that the sales tax merely replaces the imbedded tax already present in these goods and services. Secondly, the FairTax relieves all households of the responsibility for paying sales taxes on the basic necessities of life through a rebate system. Nobody pays federal taxes on the basic necessities of life. This means that The FairTax is truly the only tax reform plan that completely eliminates the responsibility for the payment of any federal taxes whatsoever on the poor. In closing, let me say that my somewhat unique position as a radio talk show host with 36 years under my broadcasting belt affords me a good vantage point from which to gauge the appeal of the FairTax to the average American taxpayer. If I ever want to sit back and take it easy for a day, all I have to do is mention the FairTax on my show. The phone lines are instantly flooded with people eager to learn more and lend their support. Extensive research has shown that the FairTax sits at the top of the list of subjects my listeners want to discuss. Additionally, we have drawn crowds in the neighborhood of 10,000 in Atlanta and Orlando, with more communities requesting rallies for their FairTax supporters. We have also seen that the FairTax, at least in my home state of Georgia, drives voters to the polls. In the recent Georgia primary election I mentioned on the air that the FairTax was on the ballot in three metro Atlanta counties. Not only did people vote for the FairTax by over an 85% margin in all three counties, but I received no less than a dozen letters and emails from listeners who said that they had no intention of participating in the primary until they heard that the FairTax was on the ballot. In one instance a man wrote to tell me that he was taking his wife home from dental surgery. Four wisdom teeth bit the dust on that day, yet upon hearing that the FairTax was on the ballot in her county, this lady insisted that her husband take her by her voting precinct before she went home to recuperate. My listeners coast-to-coast would join with me in commending the work of this subcommittee in looking for a way to make our tax laws easier to understand. There is no better solution than the FairTax. Thank you very much for allowing me to appear before you today. For full details on the research behind The FairTax consult www.fairtax.org. Additional information is also found in "The FairTax Book" by Neal Boortz, published by Regan Books.